Saturday - 2/2/08 - 1:00 pm - Me, Erin, Kent and Donna drove to New Orleans. We went to the Endymion parade. It was me and Erin's first time at a New Orleans parade. We had a good time, but the parade kept stopping for what seemed like a long time. But, the kids didn't seem to notice. We ended up leaving in the middle of the parade at about 7:30pm. We (Blair, Erin, Donna, and Kent) picked up food at Wendy's to eat at the hotel. We all took showers and went to sleep at about 9:30. Sunday - On Sunday morning, we all woke up at 4:45am to catch our flight at 8:22am. We met up with the gang (Nate, Katie, and Kennedy) at the airport and made it through security without any problems. Our flight went by really quick and only lasted 3 hours. We got our Ford Expedition rental car at about 11:30am (Colorado time), and headed for Breckenridge. We got to Breckenridge at about 1:00pm, and we could not check in until 3:30. So, we went shopping in the local outlet stores. Then, we made it to pick up our key to the cabin at 3:30pm. Our cabin was perfect. We had to check out the snow, as soon as we got there. We all unpacked and went outside to play in the snow. The amount of snow was amazing. Nate was walking in the snow, that was up past his knees. Most of us have been having trouble getting acclimated to the weather in Breckenridge. Mainly due to the altitude. Erin and Nate are having it the worst as of now, with bad headaches, light-headedness, and nausea. The rest of us headed out to get some groceries. We got in and out of the Safeway Grocery in no time with $300 in groceries. We got back to the cabin and caught the rest of the Superbowl. Which happened to be a great game. The Giants pulled off one of the greatest upsets in Superbowl history. Both Nate and Erin were still sick. Monday - Erin and Nate woke up feeling fine this morning, but Donna seems to have caught the sickness. 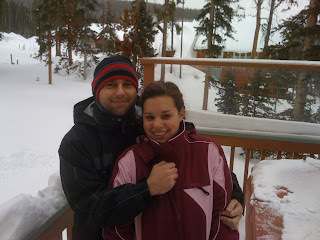 So, she stayed in, while the rest of us went to Copper Mountain to ski and snowboard. We decided to take the bus today, being that it might be a little difficult to drive on roads ( with the amount of snow that came down over night). Well, the bus ride took about an hour and wasn't real comfortable. Me (Blair) and Nate chose to snowboard, while Kent, Erin, and Katie went with skis. Meanwhile, Kennedy went to ski school. The weather was very cold and snowfall was moderate. It was quit an experience to to down the slopes in snowfall. At about 10:30am, Erin started feeling nauseated. So, I went ride the buses back to the cabin with her. She got off at our cabin, and I stayed on the bus to go snowboard some more. I did have a better time snowboarding this time. However, I think I rather skiing. I did have quit a few falls that hurt, with the worst being a whiplash. I hope I am not sore in the morning. I did get a great video using my point-n-shoot of me snowboarding and falling down the slopes. The view from the ski lift was amazing. Katie had a rough time, being her first time skiing. But she is catching on. On her last time down, she did not fall at all. Monday Night - Me, Nate, Katie, and Kennedy went tubing, while Kent took a nap indoors. I must say that tubing was better than I had anticipated. We took the bus back to the cabin, but on our last change of buses, we noticed that the wait for the last bus was 35 minutes. So, Kent called Donna to come get us. It took her and Erin less than ten minutes to pick us up. It was well worth it, because it was freezing cold at the bus stop at 8:00 at night. When we got to the cabin we all ate some very good spaghetti and went to bed. Tuesday - We all decided not to go skiing today due to sickness and soreness. Me and Nate woke up with a sore neck and upper body. With my neck sore like it is, there is no way I would be able to ski. Erin and Donna still have headaches and nausea (Donna). Kent, Katie, and Kennedy are doing fine. Kent was fine with not going skiing today, because of being sore. Kent brought Donna and Erin to the emergency room to get them some medicine for altitude sickness. While they went do that, the rest of us took naps, cleaned up in the cabin, washed clothes, and went in the hot tub (Me, Nate and Kennedy) outside. It felt very good, except our heads were freezing. We ate chili dogs for lunch while Donna, Erin and Kent were gone. They went eat at a local A & W burger joint. When they got back, Donna and Erin were wearing oxygen tanks! They looked like the old ladies at the casino. They need to wear them at least while they are sleeping. They both said that they felt better within minutes of wearing the tanks. The tank pumps oxygen into their noses. We all tried it out. Then they had a guy deliver some better oxygen units for them. These were stationary units that won't run out of oxygen as quick as the portable tanks. These units will be kept for the entire stay and we will just put them outside the cabin, and the oxygen company will pick them up. We all then decided to go eat in Breckenridge, and ended up at Steak and Ribs. This place was a nice restaurant, but the food was not worth the price. Erin and I split a $37 New York Strip steak that had a lot of gristle (cartilage type fat), which was not good. Wednesday - We all woke up feeling good, except for Katie. She had a sinus infection. So, the rest of us left to go get ski equipment at Virgin Island Ski Rentals. When we got there, Erin started getting a headache. So, we all got our gear, except for Erin, and brought her back to the cabin. 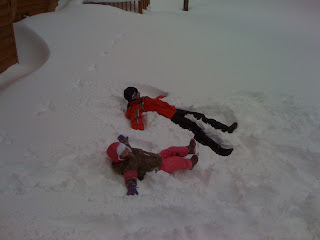 Then, when we made it to Copper Mountain, we had a huge struggle to even get to the lift for beginners (we were bringing Kennedy to ski attached to Nate). It took us about an hour to get from the parking lot to the Green Acres slope. The morning took a lot out of us. We only skied for about one hour before lunch time, where we all ate at Pizza Carlo. Then, Nate and Kent left to go ski, while I finished eating. Donna and Kennedy went take a nap in another building nearby that had some couches. So, then I went ski on a few green slopes (where I got more video of me falling) and met back up with everyone at about 4:00pm (when the ski lifts stop running). When we left when went pick up a prescription for Erin and some groceries at the Safeway. Came back to the cabin at about 6:00pm and ate nachos and red beans and rice for supper. Thursday - Erin was feeling better today and decided to go skiing with us. Kennedy went to ski school again, being that we had such a rough time on Wednesday. Everyone else started skiing on Kokomo (one of the easier greens). Today was very, very cold. Erin and I were miserable going up the ski lifts. Our feet and hands were freezing cold. Once we got off the long ski lift rides (each ride was about ten minutes), we weren't as cold. We took a break at about 10:00am, and had broccoli and cheese soup to warm us up. We then went ski down Roundabout and came back in at an hour later because we were so cold and exhausted. We then had break that ended up being about 3 hours long, involving lunch and then hot cocoa. We went on High Point to ski down one more time. And we weren't as cold as before, so we ended the day on a good note. We all had tubing reservations for 5:00, where Kennedy was so tired she fell asleep in the tube. After leaving Copper Mountain, we went return Erin, Kennedy, Donna and Katie's' ski rentals at Virgin Island Rentals; they all decided not to ski the last day. While there, we picked up a couple of pizzas at a local pizza shop and a pint of Wild Turkey and had a relaxing night at the cabin. Friday - On Friday morning, Nate, Kent and I woke up early and headed for one last trip to Copper Mountain. Before we could leave, we had to shovel our entrance onto the road due to the snow plow that barricaded us in. It turned out to be easy with all three of us shoveling. So, it did not delay us at all. At the slopes, I was originally going to ski by myself on the greens, but they convinced me to go on one blue with them. That ended up being the whole day. Friday was the best ski day we had all week, because the sun was out, it wasn't as cold, and we all stayed together the whole day. We only skied blue slopes, besides one green and one black (oops!). We were very comfortable on blues, and if we had a couple more days, we would have probably skied some blacks. We had to return all of our ski rentals, so we passed by the liquor store again for one last time. When we got back to the cabin, we had drinks and ate gumbo that Donna had been cooking since morning. We all packed and cleaned up Friday night. Here is a picture of Nate and Kent waving at me after getting off of the Excelerator ski lift. They don't have the elevation marked at this point, but we did go as high as 12,313 ft. at Union Peak, where it was very windy. Saturday - Saturday morning, we all packed up our stuff and headed for the Denver airport. Saturday involved a two-hour drive to Denver, a three-hour flight to Dallas, a hour and a half-flight to New Orleans, and a two-hour drive to New Iberia. All-in-all, Saturday went by pretty fast. I think we were all ready to be back to our 70° and above weather.